The Winter Warmer Bedding Set is a collection of 6 handpicked items items from our huge variety of quality bedding, it’s a tantalising treat perfect for keeping the cold out at winter. This bedding set includes 2 hollowfibre pillows and 2 pillowcases, as well as a smooth and soothing 100% cotton fitted mattress sheet. The Winter Warmer Bedding Set is wrapped up with a soft and toasty 13.5 Tog All Season Duvet perfect for those blustery evenings in front of the fire. 2x Hollowfibre Pillows - These comfy pillows are handmade in the UK and come with a 1 year guarantee. Made from a hypoallergenic hollowfibre and filled with Medium Thermofill filling, these pillows are a great choice if you’re looking for a steady level of support throughout the night. Their hypoallergenic properties make them suitable for people who have reactions to polyester and other similar materials. These 100% cotton, 200 thread count pillowcases are suited to the 2 hollowfibre pillows also included in this product set, providing a comfortable and protective cover. A pair of these are included in the Winter Warmer Bedding Set to make sure that your new pillows stay protected for as long as possible. This Fitted Mattress Sheet is elasticated at the corners to prevent it from becoming dislodged. 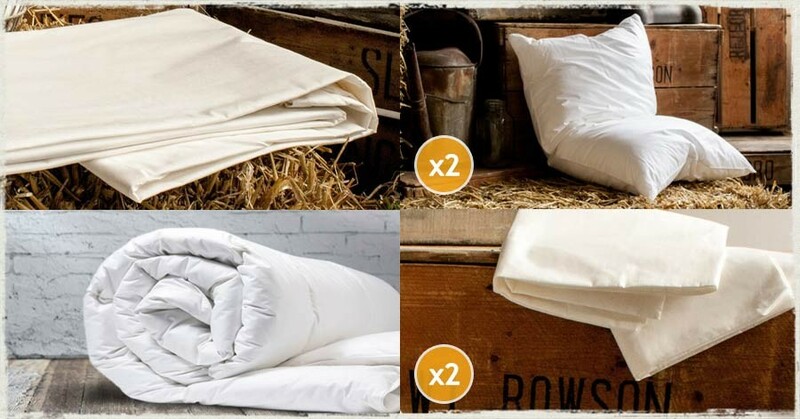 Similar to the pillowcases offered in the Winter Warmer Bedding Bundle, it’s 100% cotton, with a 200 thread count; soft, smooth and easy to settle down on. The 13.5 Tog All Season Duvet is a temptingly thick duvet that has it’s claim to fame in it’s name. It’s perfectly adaptable to each season, filled with the same hollowfibre filling as the pillow in this bundle, it provides a strong, plushy feeling which won’t deteriorate and separate within the casing. Perfect for long winter nights spent huddled in bed with a warm drink. The Winter Warmer Bedding Set is a wonderful set of quality products, perfect for the upcoming months. We’ve brought these products together into this exclusive product set to help you keep the heat in and get a good night’s sleep without the worry of waking up freezing cold in the early hours of the morning.